Like “Batman v Superman: Dawn of Justice” from earlier this year, Warner Brothers/DC are hoping that releasing a different version of their theatrical release on Blu-ray/DVD will give their movie new life and with it a possible new appreciation for what, they think, is something great. Of course, they do. There’s also the fact that it’s something of a cash grab as well. Since re-imagining the DCU (that’s DC Cinematic Universe) with “Man of Steel”, which distanced themselves from what Christopher Nolan did with Batman, and now “Suicide Squad”, their movies may have all done well at the box office, but have, for the most part, been critical failures and somewhat polarizing for comic book fans. 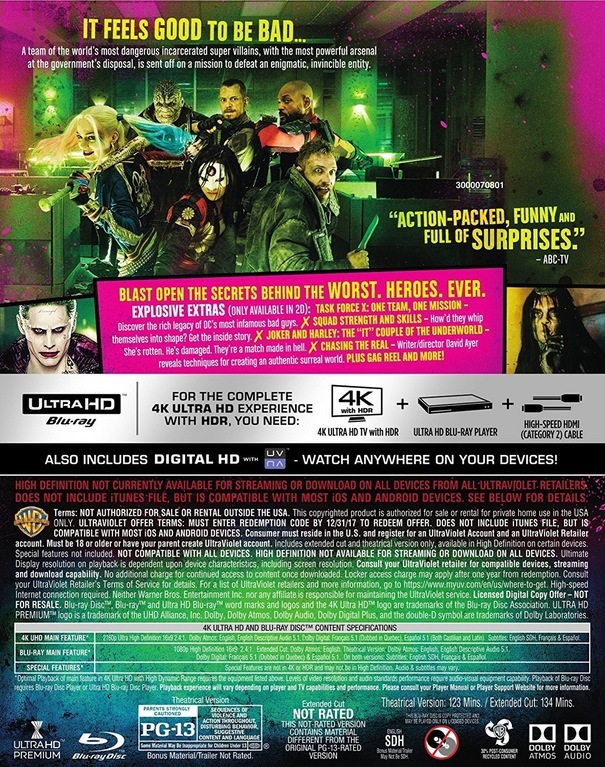 Such is the case with “Suicide Squad” and now Warner Home Entertainment is bringing an “Extended Cut” along with the theatrical version of the movie to Blu-ray/DVD, loading with a bunch of expected Special Features bells and whistles. The big question is whether or not this “Extended Cut” makes the movie any better, regardless of how you felt about the movie that came out this past August. Now, I’m not going to get into how I felt about the theatrical release, since I already covered that when it came out. Nor will I be providing a plot synopsis (I’d hate to repeat that endeavor anyway, considering how the first hour feels like endless introductions, exposition and flashbacks), plus anyone reading this will likely have seen what was released in theaters anyway. When it comes to extended cuts, I often ask, “who benefits?” from any additions the studio sees fit to include. I’m not necessarily thinking of viewers, but moreso, who benefits in the actual movie? Is there an actor/character who gets more screen time and, in turn, more development, and, if so, does it help the overall film? In Zack Snyder’s “Dawn of Justice”, the various extra scenes that were inserted throughout the “Ultimate Edition” actually helped the overall narrative (even thought the movie still had problems), but what do the added scenes do for “Suicide Squad”? 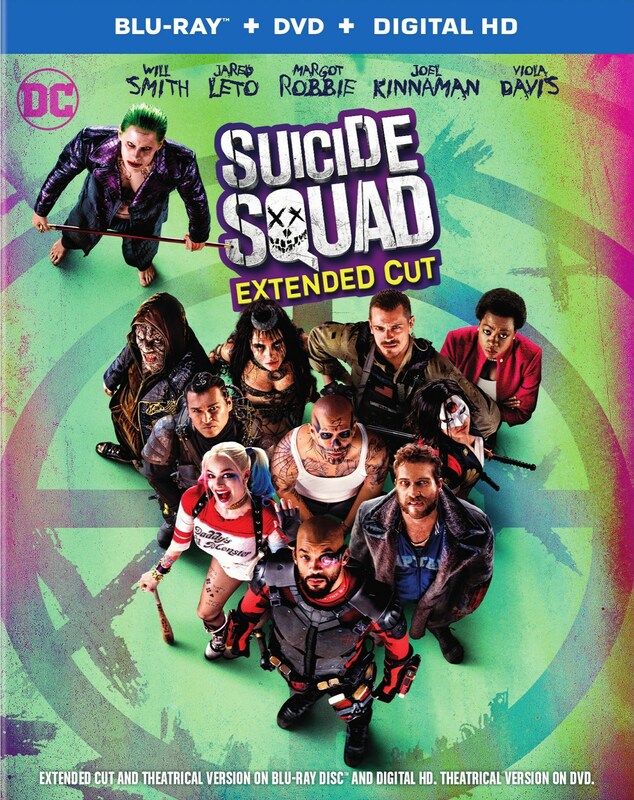 Well, the only person(s) who benefits from this “Extended Cut” is Margot Robbie’s Harley Quinn, who happens to be the actor who’s having the most fun and portraying the most interesting character in this movie. Sure, Will Smith’s Deadshot has some good lines, but Robbie has the most crazy to work with. Unfortunately, what material is added here only serves to emphasize what we already knew about Harley Quinn. The key thing is another flashback sequence involving her and Jared Leto’s Joker, this one finds Dr. Quinzel (pre-Harley Quinn Robbie) on a motorcycle, chasing after him in his neon-pink Jokermobile sports car. It reveals very little though, only showing that for some reason, she’s always coming back to him and is willing to be his homicidal sociopath match. That’s it. 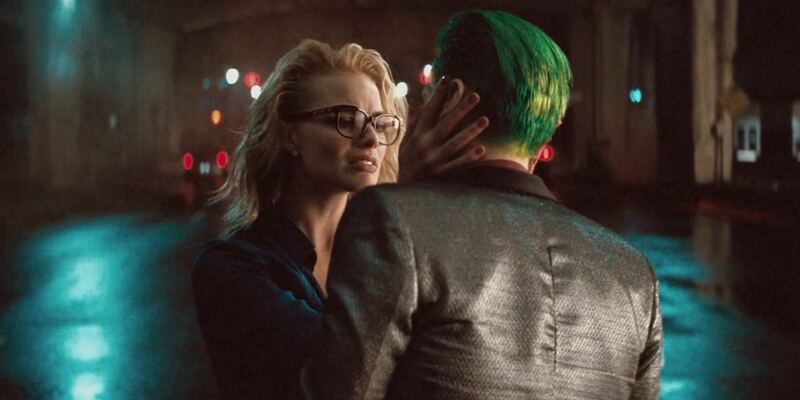 We’re still left wondering why she has this codependency for Joker, so nothing illuminating here. Beyond that, there’s some extended bits of Harley offering unsolicited psychological assessments of each of her teammates, which does very little to the overall movie. Ultimately, it’s good to see more Robbie, but it’s just not enough. We also see a bit more interaction between Col. Rick Flag (Joel Kinnaman) and Deadshot, as well as a drinking scene with the Squad that’s slightly longer, but that’s it. Considering all the rumored Leto/Joker footage that fell on the cutting room floor and that this is basically the same movie that was released theatrically, the “Extended Cut” is a let down. Maybe there’ll be more footage down the line, but honestly, I don’t care at this point (upon second viewing, I realized how annoying/distracting Leto’s performance is). This is that rare movie, where the trailers proved much more satisfying and intriguing than the final product, extended or not. There is very little to indicate any relation to director David Ayer’s previous work and distinctive style (even though he reteams with “End of Watch” and “Fury” cinematographer, Roman Vasyanov), but that’s no surprise, considering these movies (and many Marvel Studios movies) have to maintain and certain look and tone – major deviations make WB/DC nervous, I suppose. If you didn’t like the theatrical version, the “Extended Cut” won’t do much to change your mind, unless you’re just curious about more Robbie. If you liked what you saw in theaters, this won’t enhance your enjoyment all that much since the additions are less about plot/story and more about character moments. If you thought the “Ultimate Edition” made “Batman v Superman” a better movie and are thinking of giving this “Extended Cut” a try, I’m not gonna stop ya, but man, there are better movies out there to catch up with. Task Force X: One Team, One Mission: a short feature tracing the history of Suicide Squad in comics, before its transition to the screen. Those involved are Ayer, the principal cast and DC Comics writer John Ostrander, who authored a revamped run in the 80s. Chasing the Real: a featurette that looks at the film’s balance between realism and the comic book world, which includes Ayer, production designer Oliver Scholl, visual effects producer Ed Ulbrich and other contributors. Joker & Harley: “It” Couple of the Underworld : actor Jared Leto, Ayer and others discuss the film’s reinvention of one of DC’s oldest villains, and Margot Robbie talks about getting into character as one of the newest additions to DC’s rogues gallery. Squad Strength and Skills: covering training and stunt sequences with stunt coordinators Richard Norton and Guy Norris. Armed to the Teeth: property master Don Sissons covers weapons and props for each character. This Is Gonna Get Loud: The Epic Battles of Suicide Squad: a featurette that covers the choreography, rehearsing and shooting of fight scenes. The Squad Declassified: A promotional short showcasing almost each member of the squad and their weapon(s) of choice. Gag Reel: Line flubs, prop malfunctions and goofing around on set.